This is what my taxi driver said as we winded along a narrow road in the mountains of Northern Wales. Even though he is a local in the area, he was lost- and openly irritated. Finally, we made our way to my destination. And as soon as I got out of the car, I was struck by… faery magic. 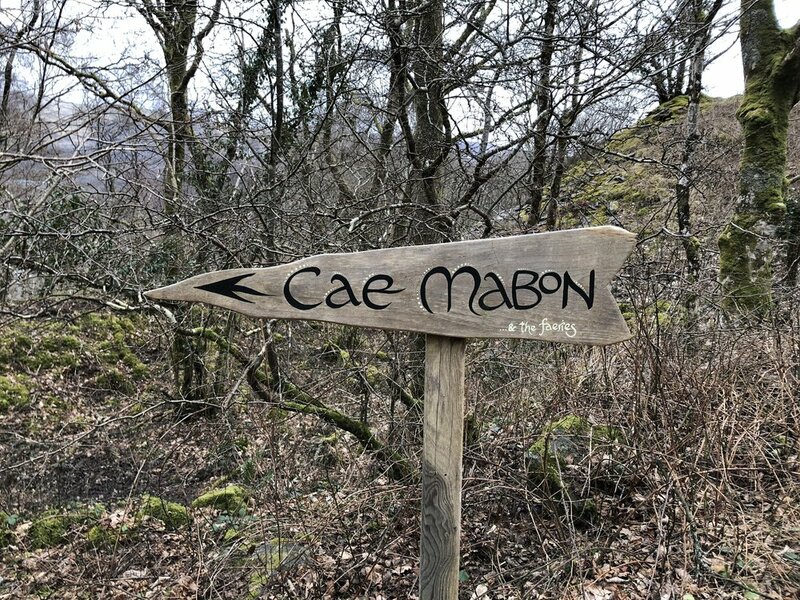 As if in confirmation, I saw this sign saying: "Cae Mabon & the faeries”. Six months prior, I’d attended a retreat for “biz witches” called “Spellbound” in Glastonbury. On the last day we did a ritual in the sacred White Spring, where we committed to approaching our work in more feminine (intuitive, flowing, magnetising) ways, rather than always being in the masculine (striving, planning, doing). Ironically, it was there that I found myself drawn to an altar with a mysterious masculine figure. I later on took an online “Faerie Awakening” course with Laura Daligan and found out who he was- a Welsh King of the Faeries and Lord of the Forest and Underworld named “Gwyn Ap Nudd”. His name means “White Son of the Mist”. During this course, I sat a few times in meditation to connect with him, and I immediately experienced a response. I feel intuitively that I ought not share the details, but I will share that what Laura Daligan had said was right- connecting with Faery Kings and Queens leave you lightheaded and filled with strong sexual energy! As some of you may know, I am an American living in the UK. I've been drawn to this part of the world, that I feel to be full of magic. My aim is to explore its sacred sites, and Wales is one of the places I’ve been meaning to visit. For a few years now, I’ve been attending tea ceremonies in London hosted by a wonderful woman named Lera. She was the one who had introduced me to this all-women’s retreat in Wales, and I thought attending it might be a good way to experience visiting there. The upcoming retreat for Spring Equinox had already been fully booked and I put my name on its waiting list. I was excited to hear then, that there was an opening for me, and I thought that I must have been meant to go. Three days before the retreat, I was in the famous Watkins Bookstore in London. I was walking up some stairs when I saw directly in front of me a book on Gwyn Ap Nudd. I wondered if it was a sign; if I was meant to take the book home with me. I'd felt that we had made a significant connection, and too briefly. I had been thinking of continuing it, even though the course was over. So I decided to take the book home, and I then remembered that he was a Welsh faery king, and I was going to Wales very soon. I wondered if that connection was relevant. So when I started reading, I was amazed to find that the specific region I was planning to go to (Snowdonia) is connected with him and his fae folk - the Tylwyth Teg! I also found out interestingly, that the author of the book- Danu Forest, was the priestess who had set up the altar in Glastonbury where I'd first encountered him. The next day (two days before the retreat), I was catching up on Skype with my good friend Kate in the US. and she gave me an oracle card reading. The card that appeared was: “Merlin Awaits- Embody Ancient Wisdom”. I was amazed to hear when she read from the booklet that Snowdonia was mentioned. On the day of my departure, I was waiting at a train platform when my phone buzzed with what I thought was a notification. I looked at it and didn’t see anything… except the time. 11:11. So… fast forward to arrival of the site of this retreat tucked away in Snowdonia- Cae Mabon. I immediately had the impression of magic and fae! And while I was there, I connected with the land full of moss, ivy, oak and waterfalls. I took it in. I took in all of its elements- Earth, Air, Fire, Water. I soaked in the waters. I sat by campfire as it cleansed me and worked through me. I ate the local food. I took lots of walks and had a favourite sitting spot on a rock in front of a waterfall (surrounded by the fae, I'm sure), where I sat for long periods. But... it wasn't all rainbows and sparkles. Being on the retreat was overwhelming and intense. I was somewhat surprised to find that I felt vulnerable being surrounded by strange women all the time, even though they were open and friendly. I was also surprised to find that I wasn't the only one who felt this way. One woman considered calling a taxi and leaving on the first day. Another spoke of perhaps needing therapy after leaving, not knowing what else to do after feeling so... disoriented and unsettled. But I also took home with me inspiration. Through the workshops, I was moved to deepen my honouring of the Earth. And I was moved to connect with and honour my cycles and my body as a woman. This inspiration was not forgotten once I left. It is still with me and acted on, even now. One night during the retreat, the sky was clear and I could see the stars and the moon glowing. I wanted to sit outside and take it in for a while. I met a woman sitting nearby who was not a part of the retreat, but a volunteer at the site. It's funny, I did not feel very comfortable around the others but it was so easy to talk to her. We had a great, connected conversation about women's cycles and the moon, and more. The next day, we ran into each other and I asked her how her day was. She said, "I was gardening today and somehow five hours passed!". She said she felt that some higher power had gotten into her to give her the energy to work the land, and it seemed like the soil hungered to be tended. "I believe that this land is calling women here," she said, "It needs our feminine energy". All this time, I thought maybe I needed the energy of the land... could it be the land needed my energy, too? During that time, I also saw the numbers 333. Some say that 333 is a number that signifies ascended masters are near, and helping you. It is also considered a number of the Divine Feminine. I now wonder: are these masculine figures (Gwyn Ap Nudd and Merlin) helping to usher in the return of the Goddess? It is said that the Divine Feminine is returning to be alongside the Divine Masculine. This year is especially considered a time focused on the rise of the feminine. Could this be why such themes have appeared for me? And perhaps for all of us, lately? To embody our bodies and listen to it? To be conscious of and honour the cycles? To harmonise with nature once again? And honour the Earth? To embrace the dark and the unknown? To just keep going, while walking the winding path? Cherry blossoms have a beauty that is ethereal, gentle, feminine and innocent. Delicate as they are, they can powerfully induce a sense of enthrallment when gazing at them. Just being around cherry blossoms can help you to receive a transmission of their healing energies. Like narcissus, which was talked about in the last post, cherry blossoms are synonymous with spring. They represent renewal, new beginnings, youth and hope. They are closely linked with Japan, as cherry blossoms (sakura) are their national flower and the celebratory tradition of hanami (flower viewing) has carried on for hundreds of years. In Japanese culture, sakura represent the concept of mono no aware, which is the wistful acknowledgment of the transience of life. As soon as they bloom, sakura petals fall gently like snow in the breeze. Their existence is fleeting and transient. They therefore also signify how precious life is, and remind us to enjoy it all while we can. Also like the narcissus, sakura have a connection to the Otherworld. In Japan, the arrival of spring is not only a time to celebrate new life. It is also when the dead are remembered, and the spirits of the land (including the ones in or near sakura trees) are prayed to for abundant crops. Perhaps this signifies how life and death are always intertwined. It is interesting to note Japan is known as the “Land of the Rising Sun”, as the Sun rises in the East. In some pagan traditions, the East is linked to spring. How appropriate then, that their national flower is connected with springtime! The East is also linked to the element Air, and sakura are indeed light and “airy” flowers. The popular Japanese anime “One Piece” shows another way sakura are regarded in their culture. They are portrayed as heart-healers. In the story, there is a man who was a thief. He found out he had a terminal, incurable heart disease, and was full of rage and despair over the situation. But one day in the mountains, he saw sakura for the first time. The sight of it elated him so much that he was miraculously cured. He was then inspired to become a doctor, and his life mission was to figure out a way to make sakura bloom in a kingdom that always snowed. The country was in crisis, and he wanted to heal the hearts of the nation. He believed the sight of sakura would save the kingdom. The cherry is a fruit that has been corresponded with Venus, so it makes sense that cherries and cherry blossoms are used for romance and love spells. Scott Cunningham shares: “A beautiful Japanese spell to find love is simple: tie a single strand of your hair to a blossoming cherry tree”. Tess Whitehurst states in her book "The Magic of Trees" how they can help us to connect with goddess energy: “In addition to being ruled by the planet Venus and sacred to the goddess of love, the cherry tree is a symbol of the Japanese goddess Konohana-sakuya Hime, who is considered a divine foremother of the human race. Indeed, the cherry tree is a potent powerhouse of divine feminine energy and can assist us in getting in touch with the goddess within..."
Sit or walk near a cherry blossom tree while it is blooming to take in its sweet, gentle, otherworldly, heart-healing and feminine energy. Bring some into your home, in a bouquet or on your altar. Take it as a flower essence, or plant a tree in your garden. Its medicine is gentle, but potent!